(Photo credit: Sumio Yamada) By Scott Gilfoid: Amir Khan (31-3, 19 KOs) says his powerful adviser Al Haymon is working on getting a fight for him against former eight division world champion Manny “Pacman” Pacquiao (57-6-2, 38 KOs) for February of 2016. However, Pacquiao is still in the process of rehabbing his right shoulder that he suffered a torn rotator cuff injury in before his loss to Floyd Mayweather Jr. on May 2nd. Unfortunately for Khan, he has a lot of competition in the Pacquiao sweepstakes. Pacquiao’s promoter Bob Arum is going to pick the best opponent from this growing list: Juan Marquez, Khan, Terence Crawford, Kell Brook and Lucas Matthysse. I wouldn’t be surprised if Arum adds another two or three fighters to the list before he moves to make his final selection. But I think the list is kind of something to give Arum cover so it doesn’t make it look like he only had one fighter in mind for the fight all along. I think it’s going to be Crawford all the way who winds up getting the fight. Khan appears to be willing to sacrifice the remainder of 2015 in waiting for Haymon to try and get him the fight. It would be smart for Khan to stay busy by fighting someone else to make sure he gets at least two fights in 2015 under his belt, but it looks like Khan isn’t interested in taking any risks that could potentially run his chances for a career high payday fight against Pacquiao. Khan just dodged a bullet in his last fight in barely beating Chris Algieri last April by a 12 round decision. 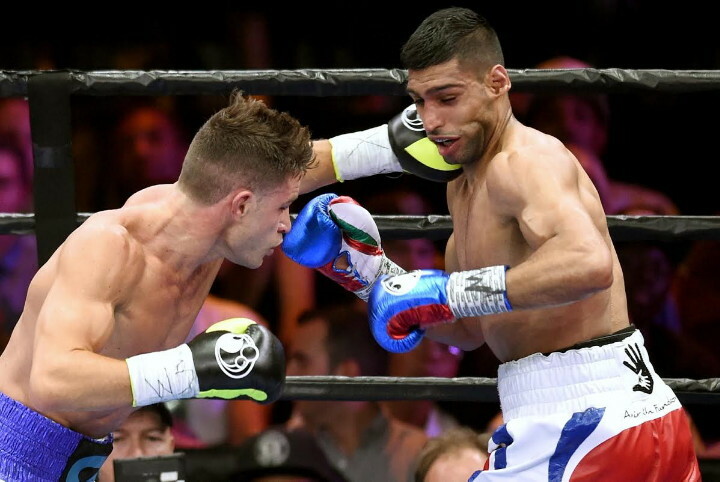 That was a really bad effort from Khan, who was constantly backed up and nailed by the more aggressive Algieri all night long. The thing is Algieri isn’t even a welterweight contender. He fights in the light welterweight division. He was picked out for Khan for some reason instead of Khan fighting an actual 147lb contender. If Khan were to face a top contender from the welterweight division the chances are that might lose, and then that would mess up his chances of ever fighting Pacquiao. It’s kind of sad that Khan isn’t going to get a second fight this year because he’s missing out on a lot of money by not fighting again this year. But he’s arguably not good enough to take a chance of fighting a top contender in my view. If they throw Khan in with Shawn Porter, Danny Garcia or Errol Spence, I think he’d be knocked out by all three of those guys. If Khan doesn’t get the Pacquiao fight in February or March, then that’ll make Khan a four-time loser in trying to get big money fights. Khan was passed over by Floyd Mayweather Jr. three times in the past for big fights. With Mayweather retiring from the sport after his win over Andre Berto last Saturday night on September 12th, Khan has seemingly run out of chances of getting a fight against him. But that’s still not stopping Khan from being optimistic and assuming that Mayweather will return to the ring in 2016, and will choose him as his next opponent. In the meantime, Khan wants to fight Pacquiao in the first quarter of next year while he waits for Mayweather to give him a call to let him know that he’s selected him for the fight rather than someone else. Pacquiao had a shoulder problem for a while, but he aggravated the injury during training camp for the Mayweather fight. The injury was worsened in that fight. Pacquiao had surgery less than a week after the fight. Whether or not Khan gets the fight with Pacquiao will depend on a number of things starting with whether his shoulder is ready for him to return to the ring in February or March next year.